Single serve storage has been perfected in our latest Carousel Deluxe Organizer. The high quality material and components used create an ultra-smooth rotation and Black Satin finish that will look great on your countertop. 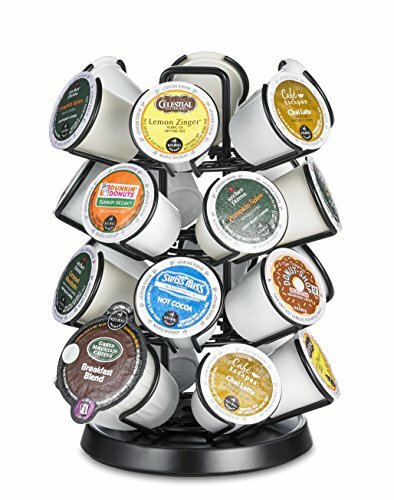 The patented carousel holds any combination of single serve k-cups, mug pods, or carafe pods. The new compact design takes up less space on your countertop while still offering a large capacity for storing your favorite k-cups. Every carousel is made with top quality steel and then coated with a durable black satin finish. The patented carousel allows for a smooth 360 degree quiet rotation that you can spin with a single finger. The Java Concepts Universal Carousel has a non-slip foam base that protects your countertop from wear and tear. Durable Black Satin Finish, Coffee pods not included. If you have any questions about this product by Java Concepts®, contact us by completing and submitting the form below. If you are looking for a specif part number, please include it with your message.